Saddle up! The newly designed 2015 Mustang GT Convertible is still the hottest thoroughbred in the sporty class. Mustang. The name says it all— unbridled power… quick as the wind… and incredibly nimble on any terrain. This latest edition, from a long line of pedigree winners, is leaner and meaner… and, as expected, is decked out with the hottest technology trappings and creature comforts— many as standard features. Unmistakably, this pony is sleeker than the last stable of Mustangs, with a wider track on chassis that’s primed for the type of powerful, spirited driving that makes you want to hit the open road and never back off on the accelerator. The new Mustang GT Convertible is comfortably cool, versatile to drive, and designed with a fresh look and style that will definitely turn heads. You’ve got to check it out in person. Ford is always looking for new ways to improve their vehicles. One of their goals is to ensure you have a safe and comfortable driving experience, and a quiet ride is part of this! Noises on the road can not only be annoying, but make us worry! Thankfully, Ford’s mobile climate and road simulators minimize on-road noise in the all-new 2017 F-Series Super Duty. The Super Duty series is Ford’s toughest series yet. This equipment puts vehicles through the most extreme conditions imaginable to test for squeaks and rattles. The simulators are called Transportable Environmental Four Posters. This references the 18-wheeler portability and four-point road simulators that are under each wheel in the chamber. Ford is the only brand to use this. “Mobile climate and road simulators are absolutely key to finding unwanted noises in the early stages of vehicle development,” said Craig Schmatz, chief engineer of Ford F-Series Super Duty. Extreme environments can bring out problems, and finding these before production are key. 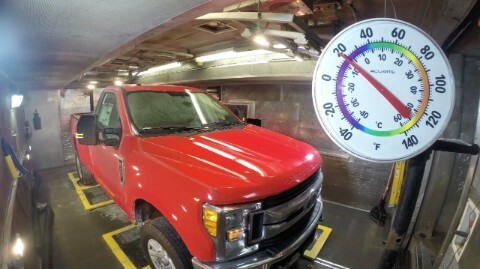 Ford puts vehicles through 20 degrees below and 120 degrees Fahrenheit to make sure they can handle it. So when you’re behind the wheel of a F-Series Super Duty, you know you’ll be safe. Ford is the second largest family owned company in the world. The very first Ford was sold in 1903 for $850. It could got a maximum speed of 30 mph. Henry Ford and Thomas Edison were lifelong friends. Jim Morrison, legendary Door singer, only ever owned a 1967 Shelby GT 500. Ford’s signature logo didn’t come about until 4 years after the company was already in production. Ironically, Chevrolet used a Ford SuperDuty to set up their Chevy Truck display at the Texas State Fair in 2012. In 1965, a Ford Mustang was brought to the observation deck of the Empire State Building in four separate pieces through using elevators. We all know and love LEGOs. And of course, we know that they model many of their toy sets after movies and television shows. But this time, they’re modeling after cars! 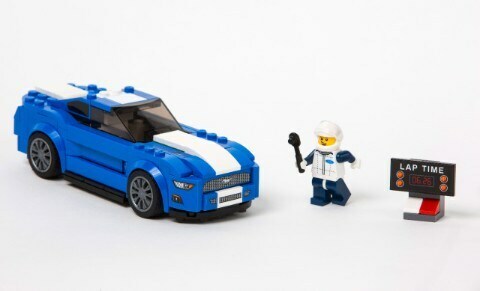 Yes, LEGO Ford cars have arrived! The Mustang and F-150 Raptor LEGO Speed Champions sets will give honor to both infamous Ford vehicles. The Mustang kit comes with a time board and race driver. The larger F-150 kit includes a garage, trailer, a crew of Ford workers and a drag racing Christmas tree and Model A hot rod. And remember, these sets don’t just have to be for kids! You can definitely get away with buying them if you’re a car lover. They’ll both be available for purchase on March 1st in LEGO and Toys ‘R Us stores. The new 2015 Ford Edge is here at Hassett with a new appearance, interior and exterior, more features and new technology and a high level of quality & craftsmanship. Long Islanders always want it all and now the NEW Ford Edge delivers! When it comes to style-performance and price the Ford Edge has got it and more. Stop down and let us show you how an Ecoboost standard engine can deliver the power to deal with the LIE, yet cruise on Main Street with huge gas savings. Then let us show you how high-tech the Crossover is with cool innovations like driver assist with sensors, radar and cameras galore to allow you to be more in control of the morning rush hour. Finally, let us show you how affordable all this craftsmanship is only at Hassett Ford. Long Islanders you can have it all and it begins with a simple visit to 3530 Sunrise Highway in Wantagh and test drive the NEW 2015 Ford Edge to see for yourself! With its sculpted curves and athletic stance, the Edge has a clean modern exterior design, a driver focused interior and a long list of technological features to meet our customers expectation of quality and innovation. The new Aerodynamic design reduces noise & vibration harshness when driving on the highway or around town. Lower fascia & rocker panels enhance the athletic stance of the car. The wide aggressive stance with a longer wheel base, new front fascia, headlamps and grill add to its dramatic look of the 2015 Edge. The 2015 Edge has the technology that keeps you in control with features such as the Front 180° camera, BLIS (Blind Spot Information System) with cross-traffic alert, lane departure warning and lane keeping system, adaptive cruise control, Ford Sync voice-activated technology and interactive screens and hands-free liftgate. Active Grille Shutters (Ecoboost models only) for maximizing Aerodynamic efficiency automatically open and close to maintain ideal engine temperature. Come to Hassett today to see the bold new design and state-of-the art technology of the new 2015 Edge. Visit Hassett Ford, Lincoln, Truck and Pre-Owned for your new vehicle! We are in Wantagh, NY in Nassau County near Suffolk County, NY. If you are looking to buy, lease, or finance your new Ford, Lincoln or Subaru at the right price, call 516-785-7800 today or visit http://www.HassettAutomotive.com. 14x consecutive winner of Ford’s prestigious Presidents Award for excellence in customer service and satisfaction. We serve Long Island, NY, Wantagh, NY and the surrounding areas. Come to 3530 Sunrise Highway, Wantagh, NY 11793. Ford October sales looked promising as the Fusion, Escape, Explorer, and Transit Connect all posted record sales for the month. Government and commercial sales were up 4% and 18% for Ford, respectively,. Thanks to the power of the MKC, Lincoln sales were also up 25% for the luxury brand’s best October since 2007. With sales totaling 22,846 vehicles, up 5% over the same month last year, the Ford Fusion experienced its best-ever October sales performance and is on pace to break the 300,000-vehicle mark this year for the first time ever. The Fusion is one of the most sought-after vehicles here at Hassett Automotive. The Escape managed to sell even more vehicles with 24,919 sold last month, marking a 12% increase and its best-ever October performance as well. The Escape is thriving in a market where the CUV and SUV segments are the fastest growing of all. With 14,455 vehicles sold, Explorer sales were up 4% for the best October performance since 2004. A final best-ever record performance came from the Transit Connect—4,068 vehicles were sold, up 28%.